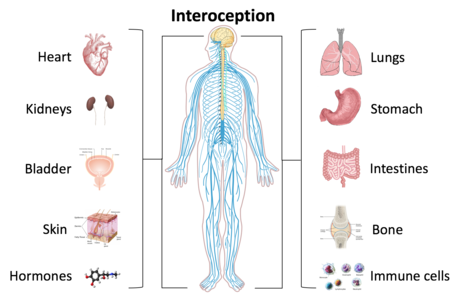 Interoception is involved in many different physiological systems like the cardiorespiratory system, gastrointestinal system, nociceptive system, endocrine and immune systems. Interoception is contemporarily defined as the sense of the internal state of the body. These can be both conscious and non-conscious. It encompasses the brain's process of integrating signals relayed from the body into specific subregions—like the brainstem, thalamus, insula, somatosensory, and anterior cingulate cortex—allowing for a nuanced representation of the physiological state of the body. This is important for maintaining homeostatic conditions in the body and, potentially, aiding in self-awareness. Interoceptive signals are projected to the brain via a diversity of neural pathways that allow for the sensory processing and prediction of internal bodily states. Misrepresentations of internal states, or a disconnect between the body's signals and the brain's interpretation and prediction of those signals, have been suggested to underlie some mental disorders such as anxiety, depression, panic disorder, anorexia nervosa, bulimia nervosa, posttraumatic stress disorder (PTSD), obsessive compulsive disorder (OCD), autism spectrum disorders, somatic symptom disorder, and illness anxiety disorder. The contemporary definition of interoception is not synonymous with the term “visceroception”. Visceroception refers to the perception of bodily signals arising specifically from the viscera: the heart, lungs, stomach, and bladder, along with other internal organs in the trunk of the body. This does not include organs like the brain and skin. Interoception encompasses visceral signaling, but more broadly relates to all physiological tissues that relay a signal to the central nervous system about the current state of the body. Interoceptive signals are transmitted to the brain via multiple pathways including (1) the lamina I spinothalamic pathway, (2) the classical viscerosensory pathway, (3) the vagus nerve and glossopharyngeal nerve, (4) chemosensory pathways in the blood, and (5) somatosensory pathways from the skin. Interoceptive signals arise from many different physiological systems of the body. The most commonly studied system is cardiovascular interoception which is typically measured by directing attention towards the sensation of the heartbeat during various tasks. Other physiological systems integral to interoceptive processing include the respiratory system, gastrointestinal and genitourinary systems, nociceptive system, thermoregulatory system, endocrine and immune systems. Soft cutaneous touch is another sensory signal often included within the interoceptive processing system. Interoception received increased visibility in the 21st century, but the concept was originally introduced by the Nobel Laureate Sir Charles S. Sherrington in 1906. Sherrington referred to interoception (although never stating the term, using “interoceptive” instead) as a way to describe receptors in the body based on their location and function. Here, interoception was confined to the viscera, excluding all receptors and information from the body that would have been considered “exteroceptive” or “proprioceptive.” In Sherrington's model, exteroceptive receptors received information from outward stimuli, like light, touch, sound, and odor. He classified temperature and nociception as exteroceptive sensations as well; however, these have now been regarded as having interoceptive qualities. He further divided the internal milieu of the body by its somatic and autonomic functions. Here, proprioceptors were localized to skeletal tissue, which control voluntary movement. Interoceptors, a term which has lost prevalence in modern literature, were thus confined to visceral involuntary smooth muscle (e.g. surrounding blood vessels). Many experiments were conducted in the 1950s and 1960s regarding interoceptive processing. However, research did not start immediately after Sherrington's discussion of interoceptors because a book by John Newport Langley was published stating that the autonomic nervous system only used efferent (brain-to-body) signaling to implement its functions. This narrowed perspective halted research on interoceptive receptors for many years. Once it became apparent that interoceptive receptors are present in many tissues of the body other researchers began to investigate afferent body-to-brain signals, mainly by conducting animal experiments to see if interoceptive conditioning was possible. Using principles of Pavlovian conditioning, different physiological systems in dogs were perturbed to elicit a conditioned response to food. For example, in one experiment, dogs’ pelvises were distended using infusions of solution when food was presented to them. After rounds of pairing the two, salivation occurred without presenting food once the pelvis was distended. Interoceptive conditioning studies like this illustrated that interoceptive sensations may be important for learned behavior and emotion. This graph shows the number of articles that reference the term “interoception” specifically from 1905 to 2015. A clear increase in the number of publications per year on the topic is seen in the 21st century. The late 1950s and the 1960s saw an increased interest in interoception based on the number of publications released during that time period that referenced the term. This increase has been referred to as the “biofeedback blip,” where researchers examined the ability of a person to gain control over autonomic functions as a method of treatment for varying conditions. Interoception did not gain widespread popularity within the scientific community until the mid- to late-twentieth century. Some researchers chose to use the term visceroceptor and interoceptor interchangeably, in line with Sherrington's definition of the term; some combined proprioceptive and visceroceptive information into one category - interoception - based on physiological data about the lack of differences in nerve impulses, and some proposed that interoception is composed of more than just endogenous (internal) stimuli. There is ongoing debate about which sensory signals could or should be classified as "interoceptive." During the 1980s, psychophysiologists began to examine cardiovascular interoception extensively, introducing several different tasks for studying heartbeat perception: heartbeat counting, heartbeat tapping, and heartbeat detection. Psychiatrists were also beginning to look at the effects of pharmacological stimulation on panic disorder symptoms as well. This led to a growing interest in interoception during this time period, including the development of theoretical models on the integration of interoceptive information within the body over time. The twenty-first century has seen an exponential increase in publications on the topic of interoception, and a recognition of the multifaceted nature of this concept. With a renewed interest in research, different ideas about interoception have emerged. One definition widens the concept to encompass “the skin and all that is underneath the skin” and the perception and function of bodily activity to more fully understand psychosomatic processes. In a similar vein, neuroanatomists hoping to find the anatomical basis of interoceptive functioning have stated the existence of a homeostatic pathway from the body to the brain that represents “the physiological status of all tissues in the body” and that this mapping onto the brain provides an individual with subjective feeling states which are critical for human emotion and self-awareness. For example, interoception is the fundament of the modern view on allostasis and allostatic load. The regulatory model of allostasis claims that the brain's primary role as an organ is the predictive regulation of internal sensations. Predictive regulation refers to the brain's ability to anticipate needs and prepare to fulfill them before they arise. Therefore, in this model, the brain is responsible for efficient regulation of its internal milieu. Interoception is sometimes generally referred to as “the perception of internal body states” although there are many interoceptive processes in the body which are not perceived. Importantly, interoception is made possible through a process of “integrating the information coming from inside the body into the central nervous system.” This definition deviates from Sherrington's original proposition, but exemplifies the dynamic and widening breadth of interoception as a concept in modern literature. This table defines many of the different facets or components of interoception. Although interoception as a term has more recently gained increased popularity, different aspects of it have been studied since the 1950s. These include the features of attention, detection, magnitude, discrimination, accuracy, sensibility, and self-report. Despite not using the word “interoception” specifically, many publications in the physiology and medical fields have focused on understanding interoceptive information processing in different organ systems. Attention describes the ability to observe sensations within the body, it can be directed voluntarily in a "top down" manner or it can be attracted involuntarily in a "bottom up" manner. Detection reflects the presence or absence of a conscious report of interoceptive stimuli, like a heartbeat or growling stomach. Magnitude is the intensity of the stimulus, or how strongly the stimuli is felt. Discrimination describes the ability to localize interoceptive stimuli in the body to specific organs and differentiate them from other bodily stimuli that also occur, like distinguishing between a heart which is beating hard from an upset stomach. Accuracy (or sensitivity) refers to how precisely and correctly an individual can monitor specific interoceptive processes. Self-report is itself multifaceted. It describes the ability to reflect on interoceptive experiences occurring over different periods of time, make judgments about them, and describe them. Brain-body interactions can also be studied using neuroimaging techniques to map functional interactions between brain and peripheral signals. Although all of these components of interoception have been studied since the mid-twentieth century, they have not been brought together under the umbrella-term “interoception” until more recently. The term "interoceptive awareness" is also frequently used to encompass any (or all) of the different interoception features that are accessible to conscious self-report. This multifaceted approach offers a unified way of looking at interoceptive functioning and its different features, it clarifies the definition of interoception itself, and it informs structured ways of assessing interoceptive experiences in an individual. This graph shows the number of articles published on interoception vs. articles published on interoceptive facets without directly referencing the term from 1905-2015. The timeline starts one year before the publication of Charles Sherrington's book, “The integrative action of the nervous system,” which introduced “interoception." This table illustrates the most common tasks that are used to assess cardiovascular interoception, broken down by the corresponding facets that they test. The exemplars at the bottom refer to specific studies or researchers who developed the task. Cardiac interoception has been widely studied as a method of evaluating interoceptive sensation. This is done using different tasks including heartbeat counting, heartbeat tapping, heartbeat detection and heartbeat attention tasks. Heartbeat counting tasks ask participants to count the number of felt heartbeats during short time periods. Their reported count is then compared with the actual count obtained with an electrocardiogram. This measures the participant's attention to his or her own heartbeat, the accuracy with which that is perceived, and the ability of the participant to report that measurement; however, results can be influenced by the participant's preexisting knowledge of his or her heart rate and an insensitivity to heart rate change. Heartbeat detection tasks work by providing a participant with a musical tone which is played simultaneously or non-simultaneously with one's heartbeat, asking the participant to report whether it is simultaneous or not with the tones. Heartbeat detection is commonly used because of its ability discern an individual's performance above chance levels, so-called "good detectors." However, such detection rates among participants for this task are usually only 35%. It also measures the participant's attention, detection, discrimination, accuracy and self-report of the interoceptive process. Heartbeat attention tasks are the most minimalistic, and involve simply the top-down direction of attention towards an interoceptive sensation such as the heartbeat, breath, or stomach. Most perceptions of heartbeat sensations usually occur during a time of homeostatic perturbation, such as when the state of the body changes from external or internal influences such as physical exertion or elevated arousal states (e.g., riding a roller coaster, watching a scary movie, public speaking anxiety, or having a panic attack). For this reason, cardiac interoception is also sometimes studied by inducing perturbations of bodily state. This can be done pharmacologically using adrenaline-like drugs, such as isoproterenol, which mimics activation of the sympathetic nervous system, resulting in increased heart rate and respiration rate, similar to the “fight-or-flight” response. This approach provides a physiological basis for understanding psychiatric and neurological disorders that are characterized by heightened sympathetic nervous system activity. Respiratory perception can differ from other interoceptive physiological symptoms because of an individual's ability to exert voluntary control over the system with controlled breathing or breathing exercises. This system is often measured using restrictive breathing loads and/or CO2 inhalation, which are designed to mimic labored breathing sensations. Dyspnea, or difficulty breathing, is a commonly felt sensation associated with panic attacks; however, due to the voluntary control of breathing, this domain of interoception usually requires implementation of much more elaborate experimental controls to quantify in comparison to cardiac interoception. Common interoceptive sensations related to the gastrointestinal and genitourinary systems are hunger and fullness. These are homeostatic signals that tell an individual when to eat and when to stop eating. The dorsal mid-insula appears to be integral in taste processing during gastrointestinal interoceptive attention tasks. Rectal and bladder distensions are used as a method to perturb the homeostatic environment of the gastrointestinal and genitourinary systems, using placement of balloon catheters which can be inflated to achieve different stimulus intensities. Associative fear learning paradigms have been used to study how innocuous signals might lead to abnormal states of gastrointestinal hypersensitivity and anxiety. Biofeedback therapy has been used for individuals with impaired gastrointestinal interoception, showing positive outcomes for some patients. Nociception refers to the receiving and processing of pain inducing stimuli by the central nervous system. Functional brain imaging studies during painful stimulation of the skin with heated probes, during mechanical compression, and electric shock have suggested that the insular cortex is prominently activated during pain processing. Thus while pain was once thought of as an exteroceptive sensation, based on functional imaging and anatomical evidence it is now understood that it has an interoceptive component. Temperature and pain are thought to be represented as “feelings” of coolness/warmness and pleasantness/unpleasantness in the brain. These sensory and affective characteristics of thermoregulation may motivate certain behavioral responses depending on the state of the body (for example, moving away from a source of heat to a cooler space). Such perturbations in the internal homeostatic environment of an organism are thought to be key aspects of a motivational process giving rise to emotional states, and have been proposed to be represented principally by the insular cortex as feelings. These feelings then influence drives when the anterior cingulate cortex is activated. The endocrine and immune systems are necessary body systems that aid in allostasis and homeostatic control. Imbalances in these systems, along with other genetic and social factors, may be linked to interoceptive dysregulation in depression. These increased allostatic changes may cause a hyperawareness of interoceptive signaling and a hypo-awareness of exteroceptive signaling in depression patients. Soft touch refers to the stimulation of slow, unmyelinated C Tactile afferents. This is accompanied by a sense of pleasantness, and has been likened to other interoceptive modalities like thermoregulation and nociception because of the similarities in anatomical function. Soft touch activates the insula rather than the somatosensory cortex, indicating that it has an affective importance absent in Aβ fibers. Since soft touch utilizes a separate pathway, it may have a social relevancy, allowing the body to separate the “noise” of outward stimuli from stimuli that evokes an affective feeling. Multiple neural pathways relay information integral to interoceptive processing from the body to the brain. these include the lamina I spinothalamic pathway, the visceroceptive pathway, and the somatosensory pathway. The lamina I spinothalamic pathway is commonly known for carrying information to the brain about temperature and pain, but it has been suggested to more broadly relay all information about the homeostatic condition of the body. The visceroceptive pathway relays information about visceral organs to the brain. The somatosensory pathway relays information about proprioception and discriminative touch to the brain through different receptors in the skin. The thalamus receives signals from sympathetic and parasympathetic afferents during interoceptive processing. The ventromedial posterior nucleus (VMpo) is a subregion of the thalamus which receives sympathetic information from lamina I spinothalamic neurons. The human VMpo is much larger than that of primates and sub-primates and is important for processing of nociceptive, thermoregulatory, and visceral sensations. The ventromedial basal nucleus (VMb) receives parasympathetic information from visceral and gustatory systems. This image divides the insula into its anterior, mid, and posterior regions, with each being denoted by different colors. The insula is critically involved in the processing, integration, and cortical representation of visceral and interoceptive information. Lamina I spinothalamic and vagal afferents project via the brainstem and thalamus to the posterior and mid dorsal insula respectively. From there, information travels to the posterior and mid-insula, which combines visceral and somatosensory information. The insula is also activated during a variety of exteroceptive and affective tasks. The insula is considered to be a "hub" region because it has an extremely high number of connections with other brain areas, suggesting it may be important for an integration of lower-level physiological information and salience. The insula connects to many regions in the brain and is highly involved in many homeostatic functions. The anterior insular cortex (AIC) is involved in the representation of “cognitive feelings” which arise from the moment-to-moment integration of homeostatic information from the body. These feelings engender self-awareness by creating a sentient being (someone able to feel and perceive) aware of bodily and cognitive processing. The insular cortex differs cytoarchitecturally based on its anterior, mid, and posterior regions. The posterior insular cortex is granular, the mid insular cortex is dysgranular (or slightly granulated) and the anterior insular cortex has no granulation whatsoever. The insula contains three major subregions defined by the presence or absence of a granule cell layer: granular, dysgranular (slightly granulated) agranular. Each of these portions of the insular cortex are important for different levels of functional connectivity. Information from the thalamus is projected to all three regions. Those with increased granulation are considered to be capable of receiving sensory input. The anterior cingulate cortex (ACC) plays a significant role in motivation and the creation of emotion. An emotion can be seen as comprising both a feeling and a motivation based on that feeling. According to one view, the “feeling” is represented in the insula, while the “motivation” is represented in the ACC. Many interoceptive tasks activate the insula and ACC together, specifically tasks that elicit strong aversive feeling states like pain. The sensory motor cortex provides an alternative pathway for sensing interoceptive stimuli. Although not following the conventional pathway for interoceptive awareness, skin afferents which project to the primary and secondary somatosensory cortices provide the brain with information regarding bodily information. This area of the brain is commonly engaged by gastrointestinal distension and nociceptive stimulation, but it likely plays a role in representing other interoceptive sensations as well. In one study, a patient with bilateral insula and ACC damage was given isoproterenol as a method of exciting the cardiovascular system. Despite damage to putative interoceptive areas of the brain, the patient was able to perceive his heartbeat with similar accuracy compared to healthy individuals; however, once lidocaine was applied to the patient's chest over the region of maximum cardiac sensation and the test was run again, the patient did not sense any change in heartbeat whatsoever. This suggested that somatosensory information from afferents innervating the skin outside of the heart may provide information to the brain about the heart's pounding through the somatosensory cortex. The relationship between interoception and emotional experience is an intimate one. In the late 19th century, Charles Darwin noted and discussed the involvement of sensations from the viscera by describing similarities between humans and animals reactions to fear in his book, The Expression of Emotions in Man and Animals. Later, William James and Carl Lange developed the James-Lange theory of emotion, which states that bodily sensations provide the critical basis for emotional experience. The somatic marker hypothesis, proposed by Antonio Damasio, expands upon the James-Lange theory and posits that decisions and the ensuing behaviors are optimally guided by physiological patterns of interoceptive and emotional information. Ensuing models focusing on the neurobiology of feelings states emphasized that the brain's mapping of different physiological body states are the critical ingredients for emotional experience and consciousness. In another model, Bud Craig argues that the intertwining of interoceptive and homeostatic processes is responsible for initiating and maintaining motivational states and engendering human self-awareness. Disturbances of interoception occur prominently and frequently in psychiatric disorders. These symptom fluctuations are often observed during the most severe expression of dysfunction, and they figure prominently in diagnostic classification of several psychiatric disorders. A few typical examples are reviewed next. Palpitations and dyspnea are hallmarks of panic attacks. Studies have shown that panic disorder patients report a heightened experience of interoceptive sensations, but these studies have failed to clarify whether this is simply due to their systematic bias toward describing such feelings. However, other studies have shown that panic disorder patients feel heartbeat sensations more intensely when the state of the body is perturbed by pharmacological agents, suggesting they exhibit heightened sensitivity to experiencing interoceptive sensations. Patients with generalized anxiety disorder (GAD) frequently report being bothered by interoceptive feelings of muscle tension, headaches, fatigue, gastrointestinal complaints, and pain. The broad consensus of studies investigating the link between interoceptive awareness and anxiety disorders is that people with anxiety disorders experience heightened awareness of and accuracy in identifying interoceptive processes. Functional imaging studies provide evidence that people with anxiety disorders experience heightened interoceptive accuracy, suggested by hyperactivation in the anterior cingulate cortex—a region of the brain associated with interoception—in several different kinds of anxiety disorders. The insula has been suggested to be abnormal in a large scale study across anxiety disorders in general. Other studies have found that interoceptive accuracy is increased in these patients, as evidenced by their superior ability in heartbeat detection tasks in comparison to healthy controls. Anorexia nervosa (AN) has been associated with interoceptive disturbances. Patients with AN often develop insensitivity to interoceptive cues of hunger, and yet are highly anxious and report disturbed interoceptive experiences, both inside and out. While AN patients concentrate on distorted perceptions of their body exterior in fear of weight gain, they also report altered physical states within their bodies, such as indistinct feelings of fullness, or an inability to distinguish emotional states from bodily sensations in general (called alexithymia). Studies suggest that patients acutely suffering from bulimia nervosa (BN) exhibit heightened interoceptive accuracy, but that some patients who have recovered from the disorder show reduced interoceptive awareness under resting physiological conditions. Further, BN patients consistently report reduced sensitivity to many other kinds of internal and external sensations, exhibiting increased thresholds to heat pain compared to healthy subjects and an increased gastric capacity. Neuroimaging literature suggests a pattern of heightened interoceptive awareness in patients with BN based on increased activity and volume in the insula and anterior cingulate cortex—regions associated with interoception and taste processing—when looking at food. Major depressive disorder (MDD) has been theoretically linked to interoceptive dysfunction. Studies have shown that women with MDD are less accurate on heartbeat counting tasks than are men with MDD and that, in general, patients with MDD are less accurate at counting heartbeat than are patients with panic or anxiety disorders. However, patients with MDD do not always exhibit reduced cardiac interoceptive accuracy; depressed patients experiencing high levels of anxiety will actually be more accurate on heartbeat detection tasks than depressed patients with lower levels of anxiety. Patients with somatic symptom disorders score lower on heartbeat detection tasks than healthy controls, suggesting that interoceptive accuracy is poor in psychosomatic disorders. It has also been found that patients with psychosomatic disorders who are anxious or stressed report physical symptom discomfort at lower heart rates during exercise treadmill tests, implying poorer interoceptive distress tolerance in somatic symptom disorders with comorbid psychiatric conditions. Results from a study investigating the relationship between obsessive compulsive disorder (OCD) and internal body signals found that patients with OCD were more accurate on a heartbeat perception task than healthy controls and anxiety patients heightened interoceptive awareness. Patients with autism spectrum disorder (ASD) may have poorer interoceptive awareness than [control] subjects. It is hypothesized that this decrease in interoceptive accuracy is due to alexithymia, which is often associated with ASD. However, it has also been found that children with ASD actually show greater interoceptive sensitivity than [control subjects] when measured over a long period of time. Further investigation into the relationship between interoception and ASD is needed in order to fully understand the interoceptive aspect of the disorder. The EPIC model proposes a method of understanding the brain's response to stimuli contrary to the classic "stimulus-response" model. The classical view of information processing is that when a peripheral stimulus provided information to the central nervous system, it was processed in the brain, and a response was elicited. The EPIC model deviates from this and proposes that the brain is involved in a process of active inference, that is, assiduously making predictions about situations based on previous experiences. These predictions, when coupled with incoming sensory signals, allow the brain to compute a prediction error. Interoceptive prediction errors signal the occurrence of discrepancies within the body, which the brain attempts to minimize. This can be done by 1) modifying the predictions through brain-related pathways, 2) altering the body position/location in order to better align incoming sensory signals with the prediction, or 3) altering the brain's method of receiving incoming stimuli. Interoceptive prediction error signals are a key component of many theories of interoceptive dysfunction in physical and mental health. As attention on interoception increases among the scientific community, new research methods and treatment tactics are beginning to emerge. Ongoing research in interoception has shown the importance of perturbing interoceptive systems. This allows researchers the ability to document the effects of non-baseline states, which occur during times of panic or anxiety. It also provides the participant the ability to gauge the intensity of sensations within the body. This can be done through pharmacological interventions, balloon distensions, or respiratory breathing loads depending on the interoceptive system of interest. Another research method used to study interoception is specialized flotation environments. Floating removes external stimuli so that individuals can more easily focus on the interoceptive sensations within their bodies. One idea with floating is that over many float sessions, patients with different kinds of disorders may learn to become more attuned or tolerant of their interoceptive sensations not only in the float tank but also in their everyday lives. Whole body hyperthermia may provide a new treatment technique for major depressive disorder. It is thought that reducing one of the bodily symptoms of depression, which is increased inflammation, using whole body hyperthermia will also reduce depressive feelings represented in the brain. In theory, these techniques will help patients better attune themselves to their interoceptive sensations, allowing them a better understanding of what occurs in their bodies. Acupuncture is an alternative treatment type for many people suffering from anxiety and depression. Typically, it is self-prescribed by patients; however, results are inconclusive on its ability to manage symptoms of depression. Recently, massage therapy has been shown to have the ability to reduce symptoms of generalized anxiety disorder. Although a universal definition of interoception has not been reached, research on interoception and psychiatric disorders has shown a link between interoceptive processing and mental disorders. It has been proposed that exposure therapy, commonly used among anxiety disorders, may provide a basis for a model of interoceptive exposure therapy that could be incorporated into treatment plans of different psychiatric disorders. One proposal states that multiple interoceptive challenges assessing different physiological systems could provide diagnosticians with the ability to create an “interoceptive profile” for a specific individual, creating a patient-specific treatment plan. ^ a b c d e f g h i j k l m Khalsa, Sahib S.; Lapidus, Rachel C. (2016). "Can Interoception Improve the Pragmatic Search for Biomarkers in Psychiatry?". Frontiers in Psychiatry. 7: 121. doi:10.3389/fpsyt.2016.00121. ISSN 1664-0640. PMC 4958623. PMID 27504098. ^ a b c d Craig, A. D. (2002). "How do you feel? Interoception: the sense of the physiological condition of the body". Nature Reviews Neuroscience. 3 (8): 655–666. doi:10.1038/nrn894. PMID 12154366. ^ a b c G., Cameron, Oliver (2002). Visceral sensory neuroscience : interoception. Oxford: Oxford University Press. ISBN 978-0195136012. OCLC 316715136. ^ a b c d Barrett, Lisa Feldman; Simmons, W. Kyle (2015). "Interoceptive predictions in the brain". Nature Reviews Neuroscience. 16 (7): 419–429. doi:10.1038/nrn3950. PMC 4731102. PMID 26016744. ^ a b c (Bud) Craig, A. D. (2009). "How do you feel — now? The anterior insula and human awareness". Nature Reviews Neuroscience. 10 (1): 59–70. doi:10.1038/nrn2555. PMID 19096369. ^ Paulus, Martin P.; Stein, Murray B. (2010-06-01). "Interoception in anxiety and depression". Brain Structure and Function. 214 (5–6): 451–463. doi:10.1007/s00429-010-0258-9. ISSN 1863-2653. PMC 2886901. PMID 20490545. ^ a b c Ceunen, Erik; Vlaeyen, Johan W. S.; Van Diest, Ilse (2016). "On the Origin of Interoception". Frontiers in Psychology. 7: 743. doi:10.3389/fpsyg.2016.00743. ISSN 1664-1078. PMC 4876111. PMID 27242642. ^ Jänig, W. (1996-01-05). "Neurobiology of visceral afferent neurons: neuroanatomy, functions, organ regulations and sensations". Biological Psychology. 42 (1–2): 29–51. ISSN 0301-0511. PMID 8770369. ^ a b c Cameron, O. G. (September 2001). "Interoception: the inside story--a model for psychosomatic processes". Psychosomatic Medicine. 63 (5): 697–710. ISSN 0033-3174. PMID 11573016. ^ a b c Schandry, Rainer (1981-07-01). "Heart Beat Perception and Emotional Experience". Psychophysiology. 18 (4): 483–488. doi:10.1111/j.1469-8986.1981.tb02486.x. ISSN 1469-8986. ^ a b c d e Khalsa, S.S.; Rudrauf, D.; Sandesara, C.; Olshansky, B.; Tranel, D. (2009). "Bolus isoproterenol infusions provide a reliable method for assessing interoceptive awareness". International Journal of Psychophysiology. 72 (1): 34–45. doi:10.1016/j.ijpsycho.2008.08.010. PMC 3085829. PMID 18854201. ^ Jones, GE (1994). Perception of Visceral Sensations: a Review of Recent Findings, Methodologies, and Future Directions. London: Jessica Kingsley Publishers. ^ Sherrington, Charles S. (1906). The Integrative Action of the Nervous System. New Haven, CT: Yale University Press. ^ a b c d e Ádám, G. (1967). Interoception and Behaviour: an Experimental Study. Budapest: Akadémiai Kiadó. ^ Fulton, JF; Nachmansohn, D (1943). Acetylcholine and the physiology of the nervous system. London: Oxford University Press. ^ Vaitl, Dieter (1996). "Interoception". Biological Psychology. 42 (1–2): 1–27. doi:10.1016/0301-0511(95)05144-9. PMID 8770368. ^ a b Ludwick-Rosenthal, R.; Neufeld, R. W. (July 1985). "Heart beat interoception: a study of individual differences". International Journal of Psychophysiology: Official Journal of the International Organization of Psychophysiology. 3 (1): 57–65. ISSN 0167-8760. PMID 4044367. ^ Brener, Jasper; Jones, J. Michael (1974). "Interoceptive discrimination in intact humans: Detection of cardiac activity". Physiology & Behavior. 13 (6): 763–767. doi:10.1016/0031-9384(74)90259-5. ^ Whitehead, W.E (1980). "Interoception - relationship of visceral perception to the voluntary control of visceral responses". Psychophysiology. 17 (3): 321–322. ^ Gorman, J. M.; Goetz, R. R.; Dillon, D.; Liebowitz, M. R.; Fyer, A. J.; Davies, S.; Klein, D. F. (June 1990). "Sodium D-lactate infusion of panic disorder patients". Neuropsychopharmacology. 3 (3): 181–189. ISSN 0893-133X. PMID 2114119. ^ R., Dworkin, Barry (1993). Learning and physiological regulation. Chicago: University of Chicago Press. ISBN 9780226176000. OCLC 26161816. ^ Sterling, Peter (2012). "Allostasis: A model of predictive regulation". Physiology & Behavior. 106 (1): 5–15. doi:10.1016/j.physbeh.2011.06.004. PMID 21684297. ^ Paulus, Martin P. (2013-04-01). "The Breathing Conundrum—Interoceptive Sensitivity and Anxiety". Depression and Anxiety. 30 (4): 315–320. doi:10.1002/da.22076. ISSN 1520-6394. PMC 3805119. PMID 23468141. ^ Garfinkel, Sarah N.; Seth, Anil K.; Barrett, Adam B.; Suzuki, Keisuke; Critchley, Hugo D. (2015). "Knowing your own heart: Distinguishing interoceptive accuracy from interoceptive awareness". Biological Psychology. 104: 65–74. doi:10.1016/j.biopsycho.2014.11.004. PMID 25451381. ^ Whitehead, William E.; Drescher, Vincent M.; Heiman, Peter; Blackwell, Barry (1977-12-01). "Relation of heart rate control to heartbeat perception". Biofeedback and Self-regulation. 2 (4): 371–392. doi:10.1007/bf00998623. ISSN 0363-3586. ^ Brener, Jasper; Kluvitse, Cecile (1988-09-01). "Heartbeat Detection: Judgments of the Simultaneity of External Stimuli and Heartbeats". Psychophysiology. 25 (5): 554–561. doi:10.1111/j.1469-8986.1988.tb01891.x. ISSN 1469-8986. ^ a b c Simmons, W. Kyle; Avery, Jason A.; Barcalow, Joel C.; Bodurka, Jerzy; Drevets, Wayne C.; Bellgowan, Patrick (2013-11-01). "Keeping the body in mind: Insula functional organization and functional connectivity integrate interoceptive, exteroceptive, and emotional awareness". Human Brain Mapping. 34 (11): 2944–2958. doi:10.1002/hbm.22113. ISSN 1097-0193. PMID 22696421. ^ Farb, Norman A. S.; Segal, Zindel V.; Anderson, Adam K. (2013-01-01). "Attentional Modulation of Primary Interoceptive and Exteroceptive Cortices". Cerebral Cortex. 23 (1): 114–126. doi:10.1093/cercor/bhr385. ISSN 1047-3211. ^ Phillips, Geoffrey C.; Jones, Gary E.; Rieger, Eric J.; Snell, Jeffry B. (1999-07-01). "Effects of the presentation of false heart-rate feedback on the performance of two common heartbeat-detection tasks". Psychophysiology. 36 (4): 504–510. doi:10.1017/s0048577299980071. ISSN 1469-8986. ^ Ring, Christopher; Brener, Jasper; Knapp, Kelley; Mailloux, Jennifer (2015). "Effects of heartbeat feedback on beliefs about heart rate and heartbeat counting: A cautionary tale about interoceptive awareness". Biological Psychology. 104: 193–198. doi:10.1016/j.biopsycho.2014.12.010. PMID 25553874. ^ Windmann, Sabine; Schonecke, Othmar W.; Fröhlig, Gerd; Maldener, Gabriele (1999-05-01). "Dissociating beliefs about heart rates and actual heart rates in patients with cardiac pacemakers". Psychophysiology. 36 (3): 339–342. doi:10.1017/s0048577299980381. ISSN 1469-8986. ^ Pohl, Robert; Yeragani, Vikram K.; Balon, Richard; Rainey, John M.; Lycaki, Helene; Ortiz, Aurelio; Berchou, Richard; Weinberg, Paula (December 1988). "Isoproterenol-induced panic attacks". Biological Psychiatry. 24 (8): 891–902. doi:10.1016/0006-3223(88)90224-7. ^ Balon, Richard; Yeragani, Vikram K.; Pohl, Robert; Muench, John; Berchou, Richard (1990). "Somatic and psychological symptoms during isoproterenol-induced panic attacks". Psychiatry Research. 32 (2): 103–112. doi:10.1016/0165-1781(90)90076-h.
^ Davenport, Paul W.; Vovk, Andrea (2009). "Cortical and subcortical central neural pathways in respiratory sensations". Respiratory Physiology & Neurobiology. 167 (1): 72–86. doi:10.1016/j.resp.2008.10.001. PMID 18977463. ^ Castele, R. J.; Connors, A. F.; Altose, M. D. (December 1985). "Effects of changes in CO2 partial pressure on the sensation of respiratory drive". Journal of Applied Physiology. 59 (6): 1747–1751. doi:10.1152/jappl.1985.59.6.1747. ISSN 8750-7587. PMID 3935641. ^ Avery, Jason A.; Gotts, Stephen J.; Kerr, Kara L.; Burrows, Kaiping; Ingeholm, John E.; Bodurka, Jerzy; Martin, Alex; Kyle Simmons, W. (2017-04-01). "Convergent gustatory and viscerosensory processing in the human dorsal mid-insula". Human Brain Mapping. 38 (4): 2150–2164. doi:10.1002/hbm.23510. ISSN 1097-0193. PMC 5575915. PMID 28070928. ^ Ceunen, Erik; Zaman, Jonas; Weltens, Nathalie; Sarafanova, Ekaterina; Arijs, Vicky; Vlaeyen, Johan W.S. ; Oudenhove, Lukas Van; Diest, Ilse Van (November 2016). "Learned Fear of Gastrointestinal Sensations in Healthy Adults". Clinical Gastroenterology and Hepatology. 14 (11): 1552–1558.e2. doi:10.1016/j.cgh.2016.04.035. PMID 27155550. ^ Rao, Satish S. C.; Ozturk, Ramazan; De Ocampo, Sherrie; Stessman, Mary (March 2006). "Pathophysiology and role of biofeedback therapy in solitary rectal ulcer syndrome". The American Journal of Gastroenterology. 101 (3): 613–618. doi:10.1111/j.1572-0241.2006.00466.x. ISSN 0002-9270. PMID 16464224. ^ a b c Craig, AD (2015). How do you feel? : an interoceptive moment with your neurobiological self. Princeton: Princeton University Press. ISBN 978-0691156767. ^ Harrison, Neil A.; Brydon, Lena; Walker, Cicely; Gray, Marcus A.; Steptoe, Andrew; Dolan, Raymond J.; Critchley, Hugo D. (2009-09-01). "Neural origins of human sickness in interoceptive responses to inflammation". Biological Psychiatry. 66 (5): 415–422. doi:10.1016/j.biopsych.2009.03.007. ISSN 1873-2402. PMC 2885492. PMID 19409533. ^ Harshaw, Christopher (2015). "Interoceptive dysfunction: Toward an integrated framework for understanding somatic and affective disturbance in depression". Psychological Bulletin. 141 (2): 311–363. doi:10.1037/a0038101. PMC 4346391. PMID 25365763. ^ a b Björnsdotter, M.; Morrison, I.; Olausson, H. (December 2010). "Feeling good: on the role of C fiber mediated touch in interoception". Experimental Brain Research. 207 (3–4): 149–155. doi:10.1007/s00221-010-2408-y. ISSN 1432-1106. PMID 20963582. ^ Blomqvist, A., Zhang, E. T. & Craig, A. D. Cytoarchitectonic and immunohistochemical characterization of a specific pain and temperature relay, the posterior portion of the ventral medial nucleus, in the human thalamus. Brain 123, 601–619 (2000). ^ Beckstead, R. M., Morse, J. R. & Norgren, R. The nucleus of the solitary tract in the monkey: projections to the thalamus and brain stem nuclei. J. Comp. Neurol. 190, 259–282 (1980). ^ Van den Heuvel MP, Sporns O. An anatomical substrate for integration among functional networks in human cortex. J Neurosci. 2013 Sep 4;33(36):14489-500. ^ Craig, A. D., Reiman, E. M., Evans, A. & Bushnell, M. C. Functional imaging of an illusion of pain. Nature 384, 258–260 (1996). ^ a b Khalsa SS, Rudrauf D, Feinstein JS, Tranel D. The pathways of interoceptive awareness. Nature Neuroscience. 2009;12(12):1494-1496. doi:10.1038/nn.2411. ^ a b Dunn BD, Dalgleish T, Lawrence AD. The somatic marker hypothesis: A critical evaluation. Neuroscience & Biobehavioral Reviews. 2006;30(2):239-271. doi:10.1016/j.neubiorev.2005.07.001. ^ Craig B. Human feelings: why are some more aware than others? Trends in Cognitive Sciences. 2004;8(6):239-241. doi:10.1016/s1364-6613(04)00103-2. ^ Damasio, A.R., The feeling of what happens: body and emotion in the making of consciousness. 1999, New York: Harcourt Brace. ^ Damasio, A.R., Self comes to mind: constructing the conscious brain. 2010, New York: Random House. ^ Ehlers, Anke and Peter Breuer. "How Good Are Patients with Panic Disorder at Perceiving Their Heartbeats?." Biological Psychology, vol. 42, no. 1-2, Jan. 1996, pp. 165-182. EBSCOhost, doi:10.1016/0301-0511(95)05153-8. ^ Domschke, Katharina, et al. "Interoceptive Sensitivity in Anxiety and Anxiety Disorders: An Overview and Integration of Neurobiological Findings." Clinical Psychology Review, no. 1, 2010, p. 1. EBSCOhost, ezproxy.amherst.edu/login?url=http://search.ebscohost.com/login.aspx?direct=true&db=edsgao&AN=edsgcl.214335265&site=eds-live&scope=site. ^ Van der Does, A.J.Willem, et al. "Heartbeat Perception in Panic Disorder: A Reanalysis." Behaviour Research and Therapy, vol. 38, 01 Jan. 2000, pp. 47-62. EBSCOhost, doi:10.1016/S0005-7967(98)00184-3. ^ a b Malejko, Kathrin et al. “Neural Correlates of Psychotherapeutic Treatment of Post-Traumatic Stress Disorder: A Systematic Literature Review.” Frontiers in Psychiatry 8 (2017): 85. PMC. Web. 20 June 2017. ^ Grossi, Dario, et al. "Altered Functional Connectivity of Interoception in Illness Anxiety Disorder." Cortex, 2017, p. 22. EBSCOhost, doi:10.1016/j.cortex.2016.10.018. ^ Etkin, A. and T.D. Wager, Functional neuroimaging of anxiety: a meta-analysis of emotional processing in PTSD, social anxiety disorder, and specific phobia. Am J Psychiatry, 2007. 164(10): p. 1476-88. ^ Pollatos, O, et al. "Differential Effects of Anxiety and Depression on Interoceptive Accuracy." Depression and Anxiety, vol. 26, no. 2, n.d., pp. 167-173. EBSCOhost, ezproxy.amherst.edu/login?url=http://search.ebscohost.com/login.aspx?direct=true&db=edswsc&AN=000263307500009&site=eds-live&scope=site. ^ Vandereycken, Walter and Ron Van Deth. "Who Was the First to Describe Anorexia Nervosa: Gull or Lasègue?." Psychological Medicine, vol. 19, no. 4, Nov. 1989, pp. 837-845. EBSCOhost, doi:10.1017/S0033291700005559. ^ Schmidt, Ulrike, et al. "A Controlled Study of Alexithymia in Eating Disorders." Comprehensive Psychiatry, vol. 34, no. 1, Jan-Feb, 1993, pp. 54-58. EBSCOhost, doi:10.1016/0010-440X(93)90036-4. ^ Nowakowski, Matilda E., et al. "Alexithymia and Eating Disorders: A Critical Review of the Literature." Journal of Eating Disorders, 2013. EBSCOhost, doi:10.1186/2050-2974-1-21. ^ Klabunde, Megan et al. “Interoceptive Sensitivity Deficits in Women Recovered from Bulimia Nervosa.” Eating behaviors 14.4 (2013): 10.1016/j.eatbeh.2013.08.002. PMC. Web. 21 July 2017. ^ Papezova H, Yamamotova A, Uher R. Elevated pain threshold in eating disorders: physiological and psychological factors. J Psychiatr Res (2005) 39:431–8.10.1016/j.jpsychires.2004.10.006. ^ Geliebter A, Hashim SA. Gastric capacity in normal, obese, and bulimic women. Physiol Behav(2001) 74:743–6.10.1016/S0031-9384(01)00619-9. ^ Schienle, Anne, et al. "Archival Report: Binge-Eating Disorder: Reward Sensitivity and Brain Activation to Images of Food." Biological Psychiatry, vol. 65, no. Interplay of Glutamate and Dopamine in Addiction, 01 Jan. 2009, pp. 654-661. EBSCOhost, doi:10.1016/j.biopsych.2008.09.028. ^ Furman, DJ, et al. "Interoceptive Awareness, Positive Affect, and Decision Making in Major Depressive Disorder." Journal of Affective Disorders, vol. 151, no. 2, n.d., pp. 780-785. EBSCOhost, ezproxy.amherst.edu/login?url=http://search.ebscohost.com/login.aspx?direct=true&db=edswsc&AN=000325432900052&site=eds-live&scope=site. ^ Terhaar, Janneke, et al. "Heartbeat Evoked Potentials Mirror Altered Body Perception in Depressed Patients." Clinical Neurophysiology, vol. 123, 01 Oct. 2012, pp. 1950-1957. EBSCOhost, doi:10.1016/j.clinph.2012.02.086. ^ Dunn, BD, et al. "Heartbeat Perception in Depression." Behaviour Research and Therapy, vol. 45, no. 8, n.d., pp. 1921-1930. EBSCOhost, ezproxy.amherst.edu/login?url=http://search.ebscohost.com/login.aspx?direct=true&db=edswss&AN=000248874300018&site=eds-live&scope=site. ^ Mussgay, Lutz, et al. "Heart Beat Perception in Patients with Depressive, Somatoform, and Personality Disorders." Journal of Psychophysiology, vol. 13, no. 1, 1999, pp. 27-36. EBSCOhost, doi:10.1027//0269-8803.13.1.27. ^ Barsky, Arthur J., et al. "Palpitations and Cardiac Awareness After Heart Transplantation." Psychosomatic Medicine, vol. 60, no. 5, Sep-Oct, 1998, pp. 557-562. EBSCOhost, doi:10.1097/00006842-199809000-00007. ^ Yoris, Adrian, et al. "The Inner World of Overactive Monitoring: Neural Markers of Interoception in OCD." International Journal of Psychophysiology, vol. 108, Oct. 2016, p. 113. EBSCOhost, doi:10.1016/j.ijpsycho.2016.07.340. ^ a b Jennifer, Murphy, et al. "Interoception and Psychopathology: A Developmental Neuroscience Perspective." Developmental Cognitive Neuroscience, Vol 23, Iss C, Pp 45-56 (2017), no. C, 2017, p. 45. EBSCOhost, doi:10.1016/j.dcn.2016.12.006. ^ Friston K (2010) The free-energy principle: a unified brain theory? Nat Rev Neurosci 11:127-138. ^ Friston KJ, Daunizeau J, Kiebel SJ (2009) Reinforcement learning or active inference? PLoS One 4:e6421. ^ Seth, A.K., K. Suzuki, and H.D. Critchley, An interoceptive predictive coding model of conscious presence. Front Psychol, 2011. 2: p. 395. ^ Pezzulo, G., F. Rigoli, and K. Friston, Active Inference, homeostatic regulation and adaptive behavioural control. Prog Neurobiol, 2015. 134: p. 17-35. ^ Stephan, K.E., Z.M. Manjaly, C.D. Mathys, L.A. Weber, S. Paliwal, T. Gard, M. Tittgemeyer, S.M. Fleming, H. Haker, A.K. Seth, and F.H. Petzschner, Allostatic Self-efficacy: A Metacognitive Theory of Dyshomeostasis-Induced Fatigue and Depression. Front Hum Neurosci, 2016. 10: p. 550. ^ a b Oaklander, Mandy. "Float Hopes." Time. Time, n.d. Web. 29 June 2017. ^ Janssen CW, Lowry CA, Mehl MR, Allen JJB, Kelly KL, Gartner DE, Medrano A, Begay TK, Rentscher K, White JJ, Fridman A, Roberts LJ, Robbins ML, Hanusch K, Cole SP, Raison CL. Whole-Body Hyperthermia for the Treatment of Major Depressive DisorderA Randomized Clinical Trial. JAMA Psychiatry. 2016;73(8):789-795. doi:10.1001/jamapsychiatry.2016.1031. ^ Kessler RC, Soukup J, Davis RB, et al. The Use of Complementary and Alternative Therapies to Treat Anxiety and Depression in the United States. American Journal of Psychiatry. 2001;158(2):289-294. doi:10.1176/appi.ajp.158.2.289. ^ Allen JJB, Schnyer RN, Chambers AS, Hitt SK, Moreno FA, Manber R. Acupuncture for Depression. The Journal of Clinical Psychiatry. 2006;67(11):1665-1673. doi:10.4088/jcp.v67n1101. ^ Rapaport, M.H., P. Schettler, E.R. Larson, S.A. Edwards, B.W. Dunlop, J.J. Rakofsky, and B. Kinkead, Acute Swedish Massage Monotherapy Successfully Remediates Symptoms of Generalized Anxiety Disorder: A Proof-of-Concept, Randomized Controlled Study. J Clin Psychiatry, 2016. 77(7): p. e883-91. ^ Farb, Norman et al. “Interoception, Contemplative Practice, and Health.” Frontiers in Psychology 6 (2015): 763. PMC. Web. 30 June 2017. ^ Khalsa, S.S., D. Rudrauf, A.R. Damasio, R.J. Davidson, A. Lutz, and D. Tranel, Interoceptive awareness in experienced meditators. Psychophysiology, 2008. 45(4): p. 671-7.